EMERGENCY ID CONTACT Wrap Bracelet / Shoe Lace Plate - Name plus I.C.E. Phone Number - Nickel Silver Pendant on 3 feet of Micro Fiber Suede - Choose Your Color! Home > Wrap Bracelets - Shoe Lace Plates > EMERGENCY ID CONTACT Wrap Bracelet / Shoe Lace Plate - Name plus I.C.E. Phone Number - Nickel Silver Pendant on 3 feet of Micro Fiber Suede - Choose Your Color! 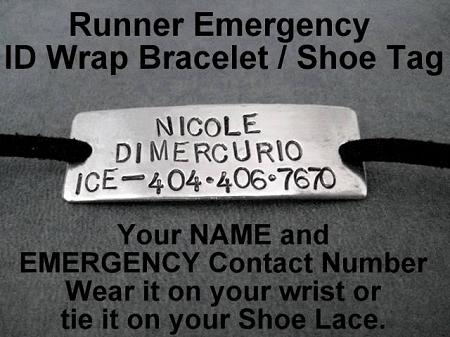 The Run Home's EMERGENCY ID CONTACT Wrap Bracelet / Shoe Lace Plate was a special request from my daughter, Nicole. As many of you know, Nicole began her professional running career immediately after graduating from the University of Georgia. Nicole's mileage increased gradually over time and now she is running many more miles each week, sometimes alone. Nicole felt like she needed a way for any emergency personnel to contact me if the need arose. She feels better and I do, too! The EMERGENCY ID Wrap Bracelet / Shoe Lace Wrap comes with one hand hammered slightly curved 1/2 x 1 1/4 inch long nickel silver pendant hand stamped with NAME and ICE (in case of emergency) and Emergency Contact Phone Number. 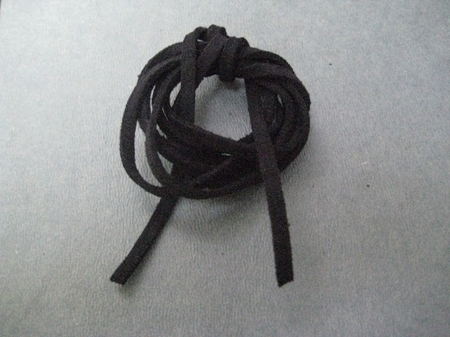 EMERGENCY ID Wrap Bracelet / Shoe Lace Wrap is made one size fits all! Simply Wrap the 36 inches of Microfiber Suede around your wrist as many times as you wish and tie! Or wrap it around your existing shoe laces and knot! Microfiber Suede Bracelet is made of 3 mm wide x 1 mm thick specially treated soft, velvety microfibers making it look like leather, only better! It will not crack, weather or smell and it washes easily with warm soapy water. Every item from The Run Home comes in a stylish black gloss jewelry box tied with a cute silver bow making it ready for gift giving. Your package will also arrive without an invoice or a receipt. I RUN BECAUSE... WRAP BRACELET / SHOE LACE PLATE - Nickel silver pendant with 36 inch micro fiber suede - Choose Your Color! STRENGTH ENDURANCE COURAGE WRAP BRACELET - Nickel silver pendant with 36 inch micro fiber suede lace wrap - Choose Your Color! MIND OVER MATTER WRAP BRACELET - Nickel silver pendant with 36 inch micro fiber suede lace wrap - Choose Your Color!